“In the event of an emergency, where is the first place you would go, if there was a need for you to leave your home or property for an amount of time?”. Litia Naitanui, held her breath for a while when she was asked by that question. She recalled the situation when her house was flooded a few years back. It was not a pleasant thing to remember, as her house was surrounded by water and she could not go anywhere. At that time, she had to go without food for a number of days. Through one of the village leaders, Litia did receive an information about the need to evacuate to a school nearby that was turned into a temporary evacuation centre. The school was flooded too, but people can still stay at the second floor classrooms – which was above the water level. But this was actually the reason why she did not evacuate. She knows that both the school and the restrooms within the school are not accessible for wheelchair users like her. She then chose to stay at her house and waited for the water to dry up, risking her life. For her, staying at home means she can still have a bit of independence to move around, unlike in the second floor classrooms where she would be totally dependent to other people. “Sadly, people thought that I am not willing to move because I cannot leave my property behind. But that is not it! For me it is a matter of accessibility of the evacuation centre. So please make sure that the evacuation centre is accessible, consult us and never assume. 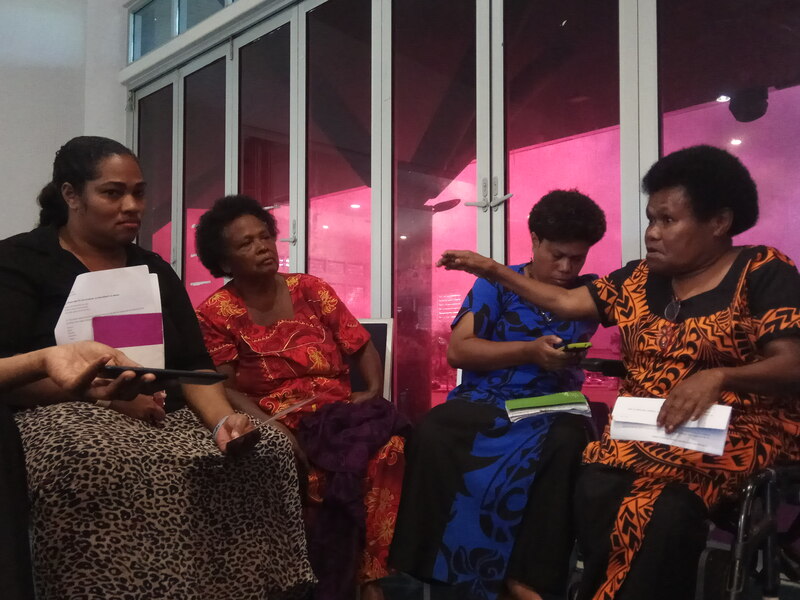 We want to be safe and we want to be involved too,” explained Litia in a focus group discussion (FGD) in Suva, on October 25th 2018. On that sunny day, FGD participants coming from different Disabled People Organisations in Central and Eastern Division of Fiji, take turns to share amongst themselves their various experiences in disaster situation, contextualised to specific disability examples with solutions that can be implemented. It was organised by Pacific Disability Forum (PDF) in collaboration with Fiji Disabled People Federation (FDPF), under the project of Disability-inclusive Disaster Risk Reduction Network (DiDRRN) and BMZ. The FGD is a follow up from the National Workshop on the implementation of Sendai Framework for DRR and the Fiji National DRR Plan for DPOs throughout the country, held in Suva in June 2018. In that workshop, participants learned about SFDRR and its commitment to all-of-society engagement, and that persons with disabilities are identified as key stakeholders in Disaster Risk Reduction (DRR). As a response to this, they gather together to share their experiences to help design and develop education materials, which will be used as an awareness and advocacy tools. This activities are part of the Disability-inlcusive Disaster Risk Reduction Network (DiDRRN) programme, lead by Arbeiter-Samariter-Bund (ASB) Indonesia and the Philippines, supported by the German Federal Ministry of Economic Cooperation and Development (BMZ). The experience shared by Litia very much resonates with the findings of the survey conducted after tropical cyclone Winston in Fiji in 2016. The study finds that out of 963 persons with disabilities interviewed, only 44 took shelter in an evacuation centre during the cyclone and only 15 were women. This indicates a lack of information about the evacuation centre, accessibility and concerns related to safety and living conditions in the shelters (PDF and UNICEF Pacific, 2016). Since the Pacific is experiencing increasingly frequent and more severe natural disasters more than any other region in the world (CBM and PDF, 2017), urgent steps need to be taken to ensure DRR activities be more inclusive to the needs and safety of persons with disabilities. Capacity building activities such as the National Workshop on SFDRR is very useful in making sure that persons with disabilities are empowered to participate and take leadership in DRR strategies. Further, consulting persons with disabilities directly and providing space for them to voice out their input such as the FGD are necessary steps to ensure evacuation shelters becoming accessible and safe environment for everyone. DiDRRN is a consortium of like-minded disabled people's organisation (DPOs) and 'mainstream' and disability-focused development and relief organisations.